New Delhi : The second and third day of Asian Designer Week witnessed the talents and creativity of young designers. These young designers impressed the fashion enthusiasts with their stunning collections and received massive applause in the event. Chitra Lal from NIFT Delhi won the title of NextGen Emerging Talent Summer 2018. Ms Chitra won the opportunity to represent Asian Designer Week at the fashion capital of the world, Milan, in Madmood Milan Fashion Week in September 2018. She will now represent ADW in Madmood Milan Fashion Week. 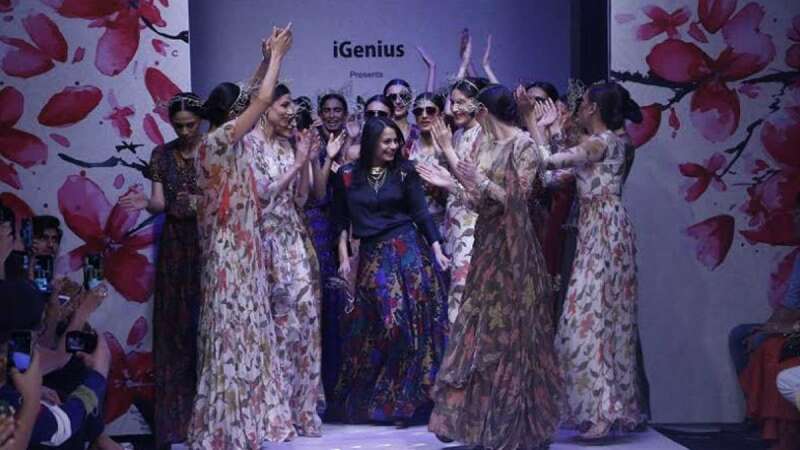 Several young and budding designers from different parts of India showcased their talents on the second and third day of Asian Designer Week. NIFT, Pearl Academy, JD Institute of Fashion Technology, Modern Art International, Banasthali Vidyapeeth, ICC, South Women Polytechnic and students from Bangladesh's BFDIT Institute unveiled their collections on the second day of the ADW. For the NextGen Emerging Talent title, 20 designers from different parts of Asia were selected under the Asian Designer Foundation Programme. The title was won by Chitra Lal from NIFT, New Delhi. Chitra Lal's collections were chosen for meeting the standards of international level. She was selected for her creative designs, innovative styles and availability in the market. After winning the NextGen Emerging Talent award, Chitra has now bagged the ticket to the fashion capital, Milan, where she will now get an opportunity to display her collections on the global stage. She will represent ADW in Madmood Milan Fashion Week in September 2018. Budding designers from Asia were the centre of attraction at this event as they unveiled their unique collections. These young designers showcased their ethnic ensemble with their skilled collections in front of the audiences. Nazakat by Yemmi, Toru Hasnat (Bangladesh), She-La collection by Maninder Gulati, Mansha by Dipika Agrawal, Capis Verlo by Aditya and Ishita, Sapna Minocha, Siddharth and Himani, Kaksa by Sushi, Kingshuk Bhaduri, God With Khadi by Namita Sharma were amongst the designers who sizzled the ADW stage during the event. Their collections were even appreciated by the buyers in the audience. Jaipur's famous designer Pallavi set the stage on fire with her superb collections. She unveiled her breath-taking collection based on Enchanted Garden theme. Pallavi entered the stage dancing on the tunes of 'Loca Loca' song. Models wearing her unique designs set the ramp on fire to give a sizzling end to the 3-day mega event. Asian Designer Week, Managing Director, Robby Rawat said, "The sixth edition of Asian Fashion Week witnessed a grand celebration of fashion and design. The stage was brilliantly complemented with the power-packed performances of young and budding designers. With this event, we have succeeded in sending out the message to the audiences what we intended for. We aimed to familiarise the fashion enthusiasts with skills and talents of young designers and I think we have just managed to do that. These young designers are the real diamonds and we wish them all the luck. Brimming with creativity several young designers showcased unparalleled talents and professionalism. Started in October 2015, Asian Designer Week (ADW) has emerged as the biggest and dynamic platform for top budding designers. ADW is the major flagship product of I Genius Entertainment, which is a sister concern of I-Genius Global Services Private Limited. The show had the backing of top fashion experts, top designers, fashion institutes and industry champions.